At the start of every year I resolve to start utilizing my weekends to prepare foods for the week, or to stock the freezer, and this year is no exception, especially with baby on board. However, this year I have more realistic expectations for myself - I know I won't spend 1 day a weekend, or even every weekend doing this, so why set myself up to break my resolution in 2 weeks?! Basically I just want to be less lazy on the weekends and actually think ahead and prep when I get home from the store, take advantage of crappy weather to make a few freezer meals, etc. When menu planning for the week I had to think of where to start with my resolution. Well, I am sick of leftovers for lunch and have been wanting Chicken Noodle Soup so why not start there? I like the recipe I've used in the past, but it's just been missing something. When searching on foodgawker I saw a fantastic looking picture from Smells Like Home that turned out to be a Barefoot Contessa recipe so I knew I couldn't go wrong. 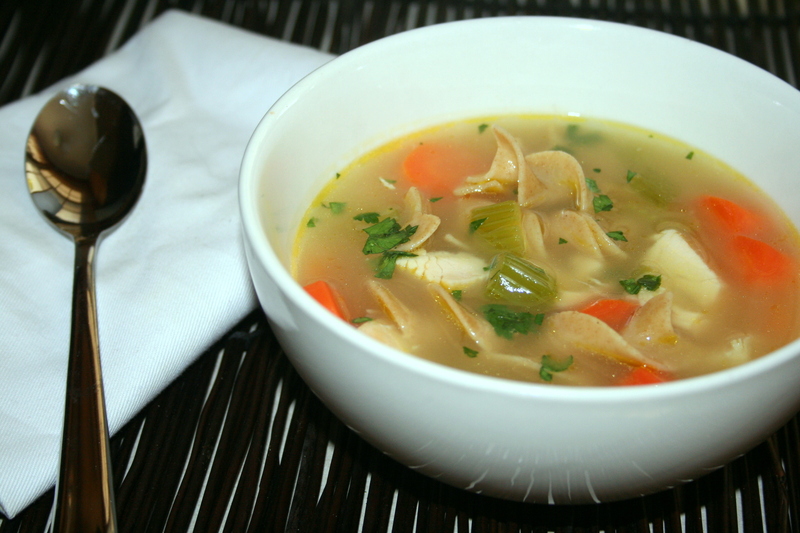 This recipe was everything I love about Chicken Noodle Soup, except it was homemade! I love lots of celery and carrots in my soup, and by using all white meat chicken and whole grain noodles I made it even healthier! The best part though was that it was quick and it freezes well! The soup makes a great workday lunch, or companion to a grilled sandwich. Heat oil in a large pot over medium-high heat. Add the celery, carrots, salt and pepper and cook for 10-12 minutes until softened. Pour in the stock, bring to a boil over high heat, and add the noodles. Cook the noodles for 10 minutes, then add the chicken and parsley. Allow the chicken to heat through. Serve hot. This looks lovely, homemade soups are my favorite thing to cook in the winter. Looks and sounds delicious, though I am a little different than you, I am not a celery person! After reading this, I am suddenly craving for some chicken noodle soup. I'll make this today, thanks for sharing the recipe.